"Mystery Object…revealed! 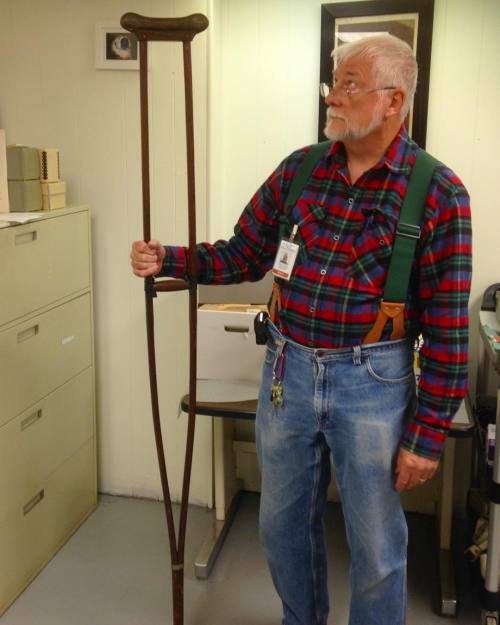 Here's George with the latest items to join our collection: The crutches of John F. Carroll, AKA the Buffalo Giant. He was an impressive 8ft tall, six inches taller than the American Giant skeleton that we have on display (#muttergiant). A few of you mentioned the name of Robert Wadlow, who was taller than the Buffalo Giant at almost 9ft. Some say Carroll was actually taller than 8ft, because he suffered from Kyphoscoliosis (a curvy spine). He's regarded to be the third tallest man on record. These crutches are not yet on display; you saw them here first! #medicalhistory #giant #med #medical #museum #philadelphia #crutch #crutches #surgery #spinal #tall #tallpeopleproblems" By muttermuseum on Instagram.